When I was making my menu plan a couple of weeks ago, I asked my kids what they’d like me to add to the menu. My 16-year-old daughter didn’t hesitate to ask for homemade chili, and I was happy to oblige. Not only is chili delicious and GREAT for this time of year (hello, comfort food!) but I love meals that I can fix in the morning and forget until dinner time. Crockpots are the best, especially for busy moms like me who spend the entire afternoon driving kids from here to there. When is there time to cook? This recipe was a bit of an accident. A happy accident. I often make “half-homemade” chili by adding a bunch “Extras” to a can of chili (so that it stretches farther and so it tastes a little better) but I was determined to find a better alternative. I turned to Pinterest, of course, and searched for “best chili” and came back with this pin, which led me to this recipe from Pink When. I tucked it away so that I could make it within the next week. Before I had a chance to make the chili, I tried making some hamburgers one night. In an effort to stretch my hamburger meat, I decided to mash some black beans and add them to the ground beef. I add black beans to dishes with ground beef all the time. I did not expect what happened…. My black bean hamburgers were a complete flop. They were a crumbly mess. I gave up on my notion of black bean hamburgers, added the cooked black bean-ground beef crumble to a tupperware, and took the kids out for fast food that night (something we never do on a week night!). The next morning, I grabbed that chili recipe I’d been saving, pulled out the crumbled hamburger, and started making my pot of chili. It could not have been easier, and the entire family RAVED about how delicious it was. 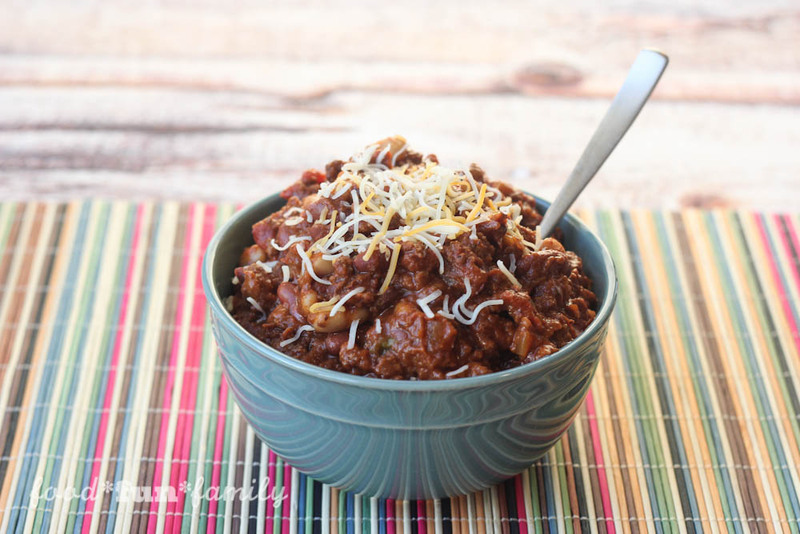 Definitely a huge improvement over canned chili (or even the half-homemade chili). Note: this recipe makes a large crock pot full of chili. If you don’t have a family as big as mine and don’t want a ton of leftovers, then I would recommend freezing half of the chili for a quick meal at a later date. 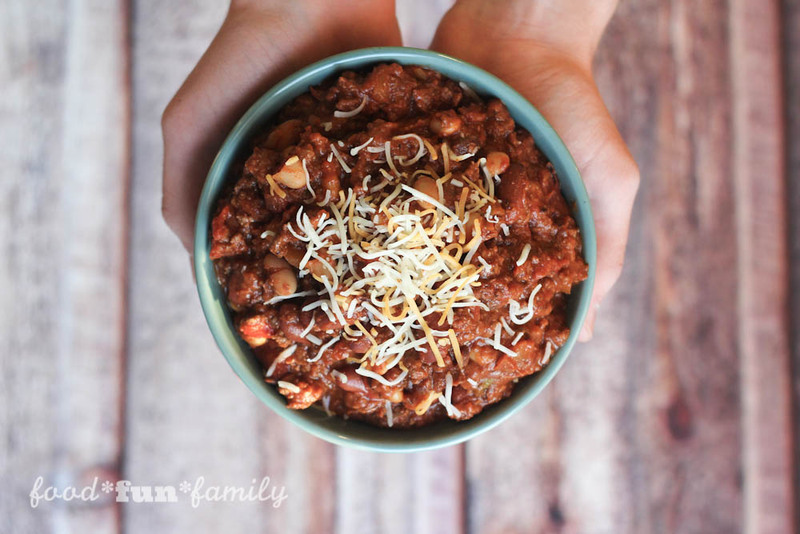 Just pull the saved chili out of the freezer and stick it back in the crock pot to warm up! 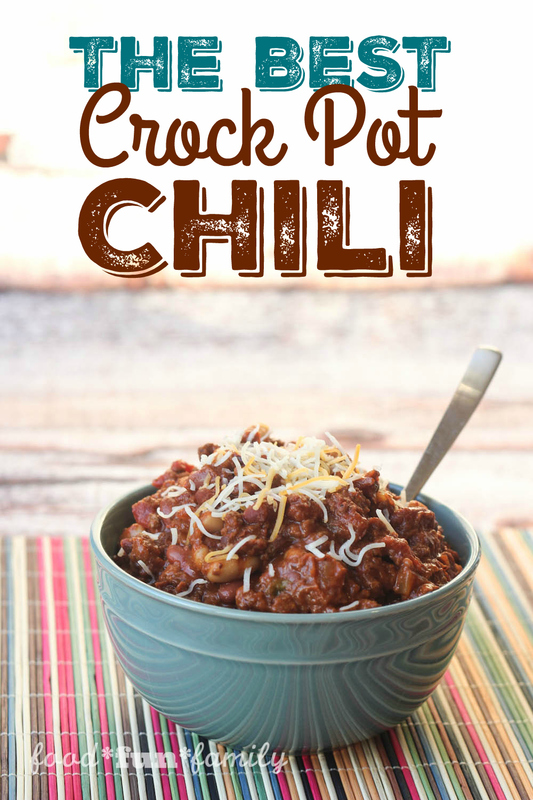 The BEST Chili Recipe – In the Crock Pot! In a medium bowl, mix mashed black beans and ground beef. Add spices to season. Brown the ground beef mixture until cooked through. Drain grease, if necessary. Add cooked ground beef mixture and all of the additional ingredients to a large crock pot and stir. Cover and cook on low for at least 5 hours (since your meat is cooked, you're mainly cooking the chili for that long to blend flavors). Serve warm with shredded cheese, if desired, and crackers or corn bread. Note: I used a canned marinara sauce from Trader Joe’s, which I think looks more like crushed tomatoes with spices than a spaghetti sauce. That is a great chili recipe you found, and I’d love to try it. I got a chuckle as I’ve had some flops with bean burgers, but I end up eating them anyway, but no repeats!!! This looks amazing except my family would kill me if I added beans, mashed or otherwise, haha! Any suggestions for keeping it thicker without the beans? Thanks for linking up at delicious dishes recipe party! My mother in law will not touch anything with beans in it, either (something this bean-loving girl simply can’t understand. lol) so I would recommend just leaving the beans out, adding more meat, and using less water (I would just add a little bit of water if it needs it). Hopefully that works for you! 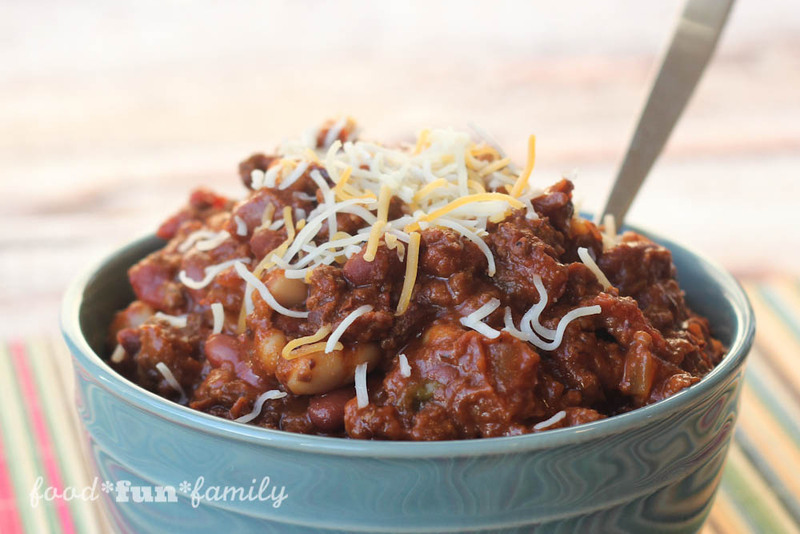 Chili is one of my favorite winter meals, and making it in the crockpot makes it so easy! We eat chili all year round. This crock pot recipe will come in handy for busy weeknights. Yes! You’ve got to make it in the crock pot – makes it SO easy! That looks amazing! I love using my slow cooker. Such a time saver. This looks and sounds delicious! We love chili, especially in the winter.